If you're interested in learning about Steampunk and are not sure where to start, I'm going to give you a few places to look. First, up are some books. 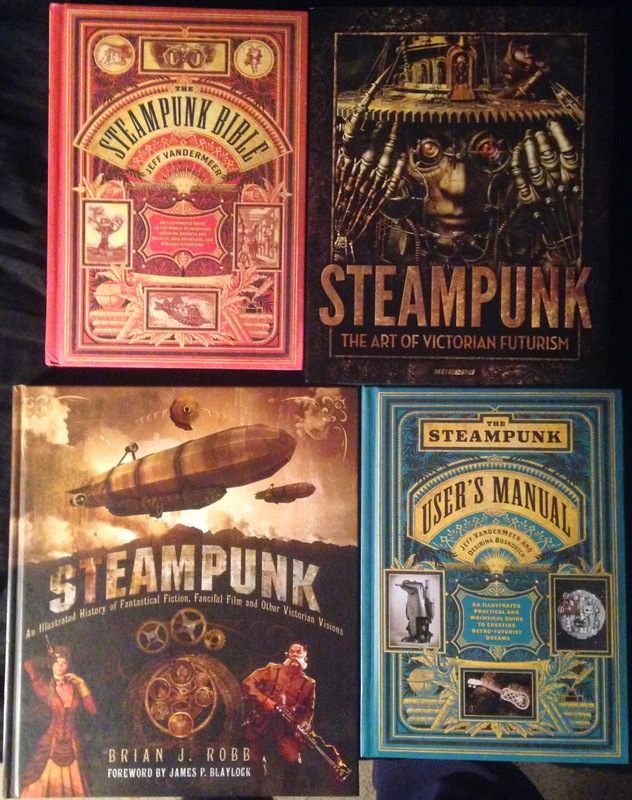 These books initially guided my way into steampunk and also helped to inspire me in some cases. Though I don't buy into everything written, they serve as a solid guide to the world of steampunk. The Steampunk Bible & The Steampunk User's Manual by Jeff Vandermeer. These books contain all the basics to point you in the right direction. They're filled with incredible photos as well of everything from costumes, gadgets, to ray guns and music and performance. Good stuff. Steampunk-An Illustrated History of Fantastical Fiction, Fanciful Film and Other Victorian Visions by Brian Robb. This book will also give you a solid foundation into steampunk. The author spends a fair amount of time discussing the origins of steampunk in literature. Tons of information in this book and a great deal to inspire you. Steampunk-The Art of Victorian Futurism by Jay Strongman. This book has a little bit of information on steampunk, however that is not the focus of the book. The true purpose is to showcase examples of steampunk creations by various artists. THIS is a must have if you want to build props. It will help you to see what others have done and also show you by example that steampunk is far more than gears. If you're not a good do it yourself-er, this book may also scare you away, lol. Steampunk really has it's roots in literature. Jules Verne and H.G. Wells being the fathers of the genre. But there are many others that can be included in the mix, like Mary Shelley, Edgar Allan Poe and even Sir Arthur Conan Doyle. And then there are the modern day Steampunk authors like Michael Moorcock, K.W. Jeter, James Blaylock, Stephen Hunt and many others. There is a great list of modern Steampunk authors and their books here. There are of course a myriad of Steampunk Movies starting with 20,000 Leagues Under the Sea (Disney) The Time Machine, The League of Extraordinary Gentlemen, Time After Time, Journey To The Center of the Earth(1959), Five Weeks In A Balloon, Chitty Chitty Bang Bang, The Prestige, Johah Hex, Hugo and many others. Check out this list for more. And if you're really anxious to get your feet wet, why not attend a Steampunk Convention? Here is a partial list of events going on in the near future. Very nice, thank for writing this.